When someone claims to have made a silent circular saw blade, the sceptical side of your nature tends to call up a handy phrase used to advertise beer, but I’m going to have to eat those thoughts. This product almost, unbelievably, lives up to its promise. 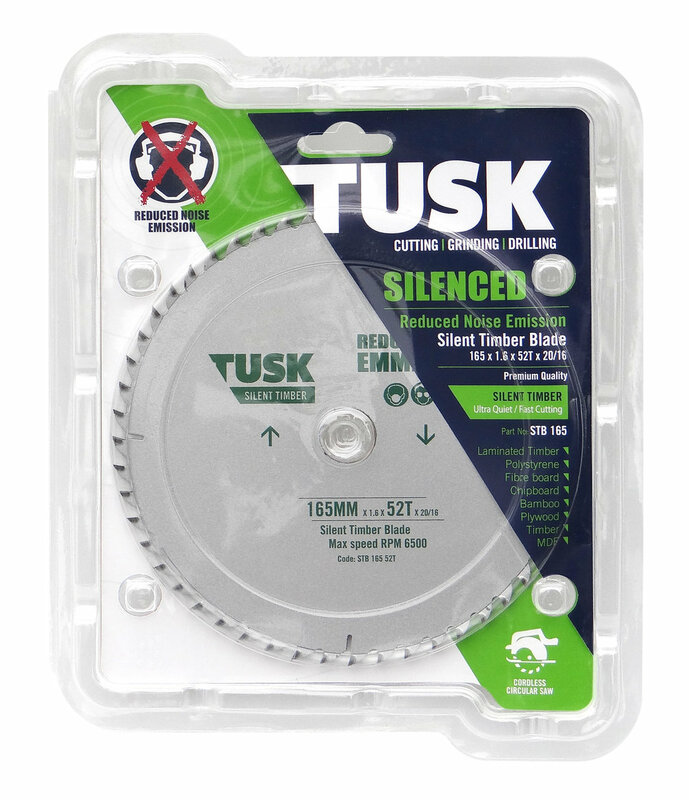 Tusk, a brand offering a range of ‘cutting solutions’ — including demolition-grade blades which go through nails and even stainless bolts — also markets a 185 mm ‘reduced noise emission’ circular saw blade they are calling the Tusk Silent Timber Blade. Reduced noise emission, yeah, but silent? So let’s put it to the test. The Shed’s offices are right above a small engineering workshop which includes a dirty room with a bench, vise, and a noise level meter. I had a basic Bosch DIY quality circular saw and a lump of four by two rimu demolition timber to hand, so we popped downstairs. The Globex Engineering crew kitted us out in safety glasses and earmuffs, so we couldn’t do a naked ear test, but then of course, everyone always uses earmuffs for this work. The old saw blade racked up 107 dB on the meter. The meter wasn’t calibrated but that didn’t matter as we were only looking at the difference in a back-to-back test. Then we changed the blade and sawed another lump off. This time the meter scored just 98 dB. Our host, Globex’s Brendon Midgley, spoke for all three of us in the room when he said, “I was blown away! Nine decibels is a massive difference.” There was virtually no difference between cutting the wood and just the sound of the saw running, so the claim of ‘silence’ isn’t that much of a stretch. When we asked others out in the main room if they had heard anything, as an indication of the annoyance factor to neighbours, they said the the same thing. They heard the saw running and the first cut, but that’s all. The silent blade pulls off this impressive trick by consisting of two very thin blades sandwiched together with some kind of compound, which reduces vibration and impact as well as noise. When you tap the blade, the difference is obvious. “Ting” goes the old blade and “putt” goes the new blade, a dead sound that makes you think it’s made of plastic. The blade is actually narrower than standard with 52 fine teeth. The narrow kerf, just 1.6 mm on a 1 mm core, also means there is much less load on the motor. It would be ideal for cordless saws as it would also give longer battery life but it also really impressed on tough wood with my corded saw. We didn’t test durability but its damping qualities also argue for a longer blade life. They retail at $70 which is about twice the price of a standard blade but then, you are getting two blades (glued together), a whole lot of quiet, and less operator and neighbour fatigue.